A titanic sunspot—about four times the size of Earth—has appeared on Jan. 1, 2014. 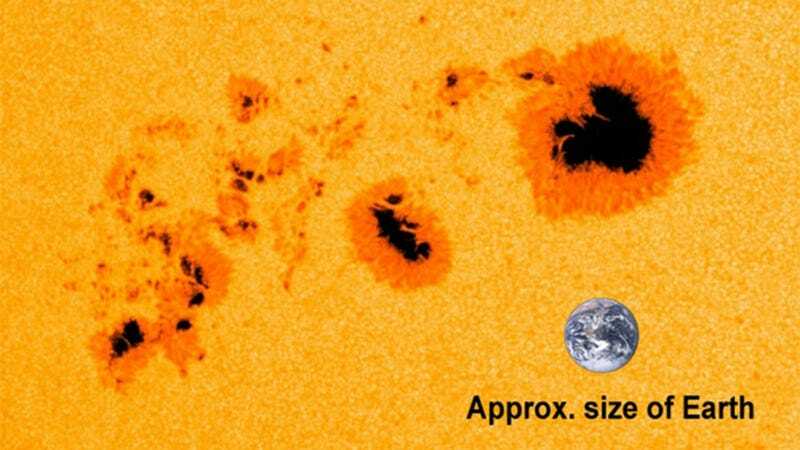 Called AR1944, it's the largest sunspot in almost a decade. This image from NASA's Solar Dynamics Observatory shows it compared to our planet. They are so large you can see them with your naked eye. Another image taken on January 5 by Jürg Alean, shows them at sunset. Remember to use protection when looking directly to the sun. Sunspots are dark areas on the sun's surface that contain complex arrangements of strong magnetic fields that are constantly shifting. The largest dark spot in this configuration is approximately two Earths wide, and the entire sunspot group is some seven Earths across.